Women who accept their bodies, flaws and all, are more likely to eat healthily or intuitively, new research shows. This suggests that women’s typical reasons for dieting — dissatisfaction with their bodies — may backfire. Tylka, an assistant professor of psychology at Ohio State University’s Marion campus has conducted several studies on the concept of intuitive eating. In one study published in April involving 199 college-aged women, Tylka found that women who followed intuitive eating principles had a slightly lower body weight than women who did not. “Intuitive eating was negatively associated with body mass, such that people who ate intuitively weighed less than people who dieted,” she said. The studies found, among nearly 600 college women, that those with higher levels of appreciation and acceptance for their body were more likely to be intuitive eaters. Intuitive eaters spend less time thinking about how their body appears to others and more time considering how their body feels and functions, Tylka observed. They “perceive the body as an agent of action rather than an object of attraction…focusing on how the body functions rather than its appearance,” according to Tylka. Intuitive eaters also reported receiving more positive messages from parents and others regarding their bodies. Dr. Keith and Laurie Nemec’s comments on Body acceptance tied to healthy eating. Interesting in this study was they compared the women who accept their bodies for “flaws and alls” they said, are more likely to eat healthy or intuitively. It also suggests that women typically eat or go on a diet because of dissatisfaction with their bodies usually do not lose the weight. So what the study showed was, intuitive eating has three components, unconditional, permission to eat when hungry and whatever food is desired. Now add a side note to this. Whatever food is desired is when you are really in tune with your body, the body will know what it needs. It doesn’t mean because I want ice cream that’s what I should eat, or because I want cookies, that’s what I should eat. When you very in tuned with your body, you body will crave the things that are healthy for it, but common sense knows what those healthy things are. It’s a living/raw plant based diet and it’s a diet that is the void of harmful substances like refined sugars, and such. The second component was eating for physical rather than emotional reasons. The third was reliance on internal hunger and fullness cues. They didn’t just eat three times a day, they ate when they felt a need to eat. This was intuitive eating, and they felt to eat what their body was hungry for when they were in tune to their body, and it wasn’t just emotional eating or sugar cravings or wrong food cravings. And what this study published found that women who followed this intuitive eating had lower body weight that women who did not. Interesting in this study is it’s basically just showing that when women lose weight because they are dissatisfied with their bodies, it’s almost always a fear factor. They’re eating out of fear of becoming more overweight and being even more dissatisfied with their body. Whereas, on the positive side, when a woman would eat intuitively, they are accepting their body for what it is, they’re not eating for their body, their eating just as the body would tell them. This is a much healthier way of eating, and there’s research studies to show a more significant weight loss. And that’s because they are not focusing on weight, they’re focusing on health. This is a very key point not only in weight loss but in total health. In total health when we focus on our health and our healing, instead of our sickness and disease, this, this promotes total health. So, you can extend it to any area of your life, or health. When we focus on health, when we focus on the positive and not the negative this will promote a much greater benefit in every area of our life. This is focusing on health. This is the approach that we would take in all sickness and disease. First focus on health. 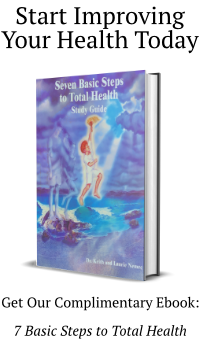 So, if a person has cancer, the first focus is not, “I have to get rid of the cancer”, the first focus is “I have to be as healthy as God created me to be” and when I do the 7 Basic Steps to Total Health, and I remove all the blockages and become as healthy as I can be, then my body can naturally heal all diseases including cancer. What a beautiful way to look at life. To look at it from God’s point of view instead of our blocked, old nature view. Which is always in fear and always stressed and always looking at the negative. So again, the best way to lose weight is the best way to become healthy, the best way to live your life, which is just focus on all that makes health and being healthy in body, mind and spirit, and not focusing on the negativity or the disease or the sickness or the imbalance.